Some of the easiest world records to set are food records, because even though it isn’t easy to build a giant food item, it is a heck of a lot easier than, say, being the fastest person up Mount Everest. In Minneapolis, Minnesota, the world’s largest cupcake was unveiled this past weekend. It measured 12 inches tall and 24 inches wide, which is much smaller than I would have expected it to be, but it weighed in at an impressive 150.7-lbs. This figure included 60-lbs of frosting and 15-lbs of fudge filling. The cupcake was made by cakes.com, which is run by cake-decoration supplier DecoPac. Personally, I think that the line in between a cake and a cupcake is a little fuzzy at this scale. Part of the point of a cupcake is that it is a cup-sized cake. Even the Giant Cupcake Pan from Wilton seems to acknowledge that it is just a cake shaped like a cupcake. Is that all this giant cupcake really is? A cake shaped like a cupcake? It’s still tasty looking, no matter what you decide to call it in the end. Speaking of ends, most record-setting foods are sliced up and shared with onlookers. This cupcake was shipped out to a pig farm after it was measured and photographed at the Mall of America. About 4,000 smaller cupcakes were given out to onlookers. Want to see a free screening of Julie & Julia? Previous PostPrevious Want to see a free screening of Julie & Julia? How long do vanilla beans last? woah. insanity. i guess a giant cupcake is just a big cake. but let’s not get into technicalities. 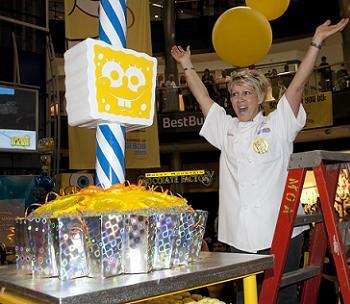 I live in Minneapolis and in early 2008, Duff Goldman was here at the Mall Of America to do this very same thing: break the record. His cupcake looked simply like a large cake, but it set the record. THEN, Guinness World Records rescinded the award, because they learned he made the cupcake in two parts! I am more intrigued by cakes, after learning that. I love the “Challenge” cake shows on Food Network! Looks good to me! So does this mean my pan of bar cookies is really the world’s biggest bar cookie? I don’t get how that can win when Duff attempted the largest cupcake as well. Wow this cake can be serve in a wedding ceremony.Your right just imagine how large is the Baked pan use on this one. At 150 kilograms, it’s more than twice the size. However, I agree with veggievixen. A cupcake is a little cake that fits in a cup, isn’t it? A giant cupcake is . . . a really big cake. Of course, it’s probably still really yummy. I couldn’t wait to open this email. I was expecting something spectacular. It doesn’t really look like a cupcake, does it? how is there even a category for biggest cupcake? the point of a cupcake is that it’s a mini cake. disapproval, guinness. Gee I wonder what they put in it to have made them have to send it off to a pig farm. Follow the quest to bake the Worldâ€™s Largest Cupcake | That's Cooking!